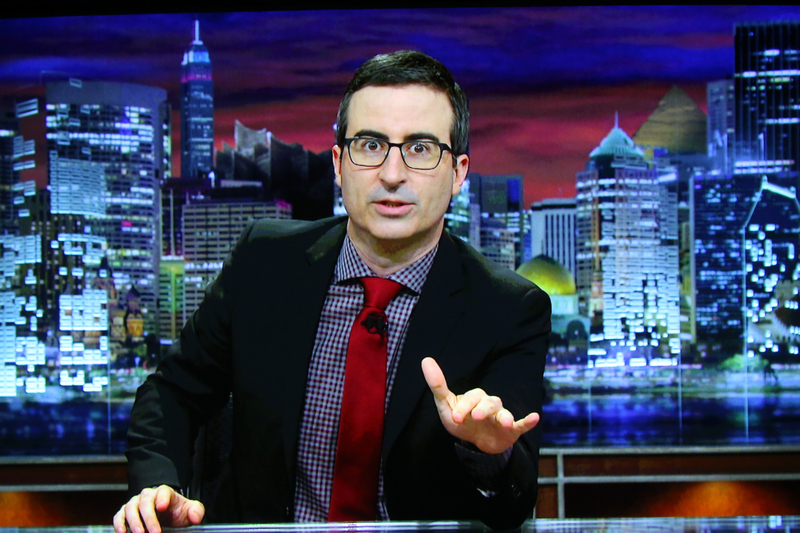 Unlike a certain Republican candidate, John Oliver actually tells it like it is — and, fortunately, he knows how to make us laugh in the process. Whether they're from HBO's Last Week Tonight, his stand-up appearances, or his past segments on The Daily Show, his jokes often deliver much-needed advice for the country and its politicians. Sometimes, Oliver's hard truths are also the advice you need in your own life, in a sad but hilarious way. Late-night hosts in general are known for their jokes, but Oliver has a particularly memorable way of saying what we're all thinking. Maybe it's the accent, maybe it's the funny segments, but either way, he makes his point about some newsworthy and often political issue, and viewers can't stop listening to him. In this way, it's probably a shame that more people don't listen to him. Oliver doesn't shy away from talking about the serious issues like gun control, government surveillance, and corruption (like the recent FIFA scandal). While you may not need to control your own use of guns, you can still learn a thing or two from Last Week Tonight, even if it's just how to appropriately quote the Founding Fathers. Your younger siblings probably don't care about drug companies, but they definitely care about gossip, drama, and boys/girls. Make sure to set the record straight for them, like Oliver would. Oliver used this metaphor to describe the contradiction that so many people around the world face in loving soccer, but hating FIFA. The sausage principle can, no doubt, apply to many things, though: sausage, fast food, that witty drunk text you sent your ex but don't remember. In other words: Be careful what you wish for. This is one of those jokes that more people should probably listen to, particularly if you're a TV and cell phone company. The grass is always greener, especially when Oliver is taking on the news. Oliver deals in hard truths and tough love and not even the holidays are spared. At least the frenzy of Y2K is behind us. Don't get me wrong, I'm a total news junkie. But sometimes, the crime, war reports, and sad stories about stray animals just get to be too much for one week. If you haven't watched the news all week, congrats — and Oliver can catch you up with what's most important. We've all been there. You've already binge-watched House of Cards and you've re-watched Friends until you have everything Rachel says memorized, so now you head to some foreign documentary that Netflix's algorithm recommends. Take it from Oliver and get some fresh air. Granted, this change is probably a good thing for Oliver, who has grown quite a successful comedy career in recent years. Too bad change hasn't been so good to politicians, particularly those currently running for president. Oliver doesn't miss a beat when it comes to hilariously ranting about the world's biggest issues. Be he also doesn't miss a beat in terms of making those rants relatable. No matter how much they sting, his hard truths are usually right on target.